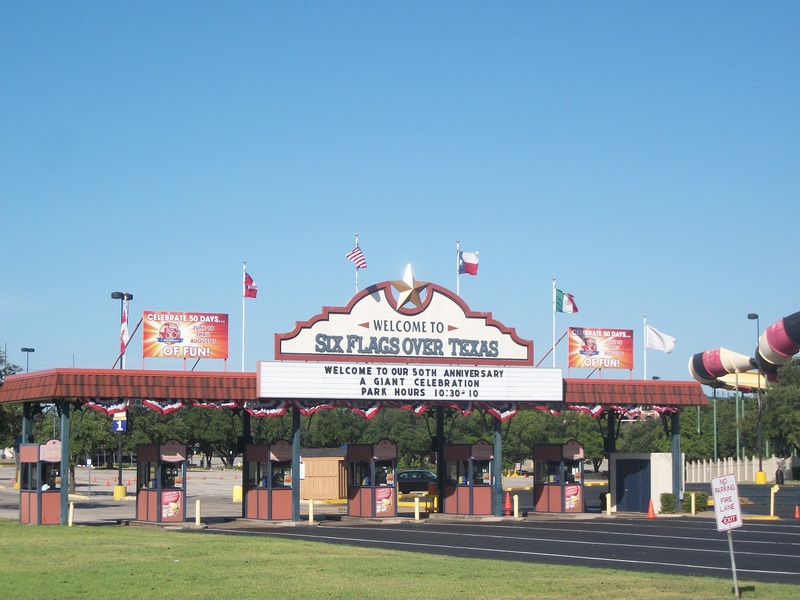 Fun Fact: "Six Flags" is named after the six countries that have governed Texas: Spain, France, Mexico, Republic of Texas, Confederate States of America, and the United States. As you know by my last post, I took Cameron to Six Flags for a late birthday present! We had lots of fun! Six flags isn’t a cheap place to go, but there’s lots of ways to make it as affordable as you can. These tips are for Six Flags, but I’m sure many of them can be used at other places too. Never, ever, ever just show up as Six Flags and pay full price for tickets!! Look online before going so you can find any coupons or promotions. We purchased our tickets online, instead of at the gate. That saved us not only time, but also money. Plus Cameron googled Six Flags coupons and was able to find a coupon for the day we were going to be there, saving us a litttle more. We ended up paying $27 each, instead of the $57 price we would have paid if we just showed up and payed there with no planning ahead. So that saved us a total of $60 (saved $30 each ticket)! That was WAY worth the few minutes of searching the internet and planning ahead! If you plan on going to Six Flags more than once that year you may want to look into a season pass. First of all if you’re planning a Six Flags trip you’re gonna need to stay hydrated. Especially if it’s in the middle of summer. You can purchase a Six Flags bottle for $13 and get unlimited refills the rest of the day. If you’re not a germaphobe you can share the cup with your friends or family that you’re there with. Another option for the drinks is to take a Six Flags cup you already own (we borrowed one from family) and you can get if filled up for 99 cents. We figured we wouldn’t need to get it filled more than 13 times that day, so it was a better deal for us than buying a new cup. We ended up only getting it filled a couple of times and would just fill it with water at the water fountains instead. As far as food….well it’s expensive. We planned on going out to our car and eating some food we had packed and then going back into the park for more rides (make sure to get stamped out or you’ll have to purchase another ticket to get back in). But we didn’t end up doing that, we ended up getting a brisket burger, fries and poweraid and just split it. And that cost us about $15! We can usually feed our whole little family of 3 eating out for that much! So if you want to save on food, keep a cooler with lunch in it out in your car. The best way to save on souvenirs is to just not buy them. I’ve never been a big fan of little trinkets that just sit around and collect dust, so those giant stuffed bananas or cheesy snow globes don’t really tempt me. But I have heard of people buying Disney things before a Disney World trip, since you can get that kind of stuff other places. Then when the kids see all the cool Mickey Mouse stuff that’s way over priced at Disney World, their parents can give them the things they bought previously for a much better cost. If you can, only take what you don’t mind carrying, or else you’ll end up renting a locker. Of course if you’re going with a bunch of little kids or babies that may be harder to do. 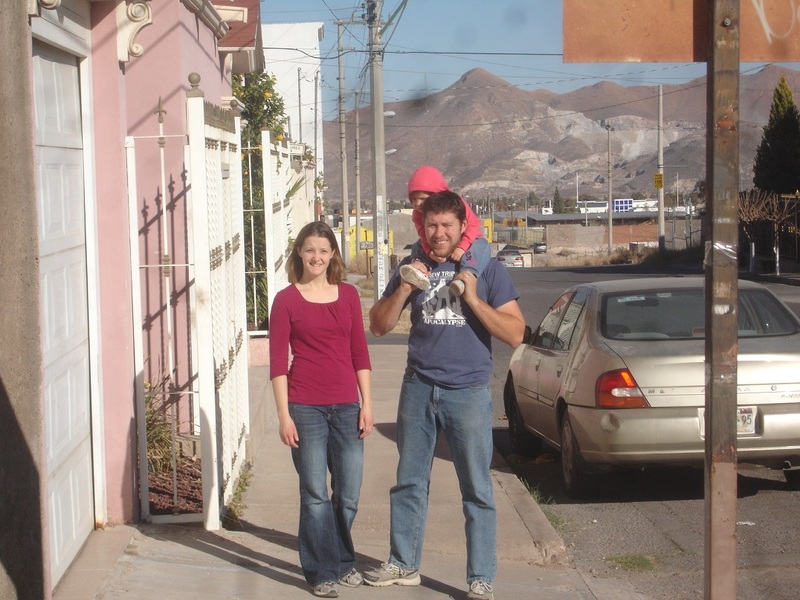 We only took what would fit in Cameron’s pockets (thank goodness he wears cargo shorts with those big pockets).The only thing we carried was the water bottle. Speaking of carrying things in your pockets, Cameron put cash and his cell phone in a Ziploc to make sure they wouldn’t get wet if we went on one of the splash down rides. Also plan ahead so you don’t end up renting a stroller or buying sunglasses because you forgot them. So there’s some Six Flags savings tips, I’m working on a post about saving on trips in general, so be watching for that! But I am planning some posts on how to save at Six Flags and how to save on trips in general, so be looking for those next week! This picture has nothing to do with my post, I just decided I didn’t want 2 posts in a row with no pictures! Here’s a yummy marinade from my mom. I did it with chicken breasts cut into strips, but you can also use beef. They’re especially good if you marinate them for a day or two. You can cook them on the grill or in a pan on the stove top. Frugal Photo Friday – My New Sheets! That's a savings of $13.88!2 posts in one day!! I’ve been wanting new sheets, but I just couldn’t justify buying them. Afer all the sheets I had were doing the job. There were no holes in them or anyting. I was just tired of the pattern on them and they were getting faded and kinda grungy looking (even after being washed). So I kept telling myself that they still worked just fine and that no one except us sees the sheets anyways, since they’re always covered with a blanket. 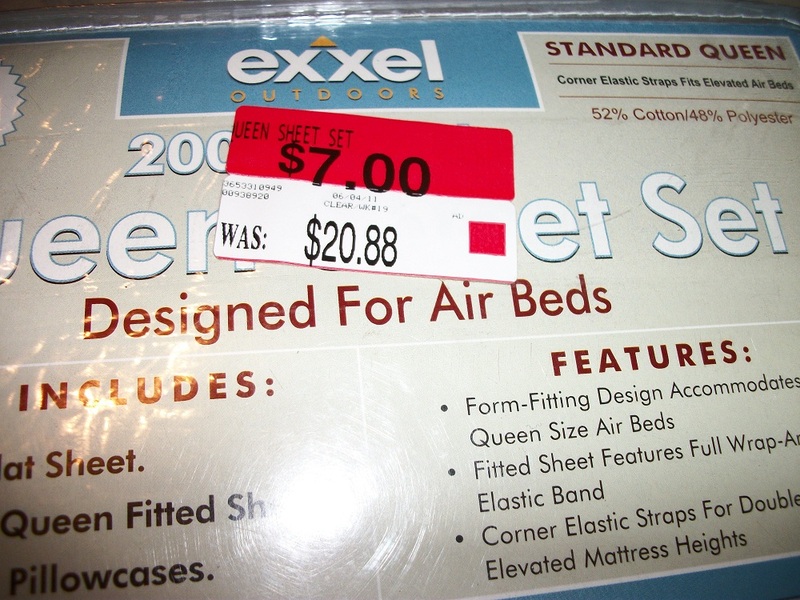 But then one day in Wal-Mart, after months of wanting new sheets, I spotted these sheets on a clearance rack! Only $7 (originally $20.88), so I decided to buy them, and I was so happy! =) It wasn’t until later, after I had the sheets already on the bed that I realized they’re for air beds, but they’ve been working just fine on our normal mattress, so I don’t really care if the label says “air beds.” And of course I still have our old sheets as a spare set. So I guess the moral of the story is, if there’s something you want, but don’t need, just keep waiting, you may be able to grab a great deal eventually! 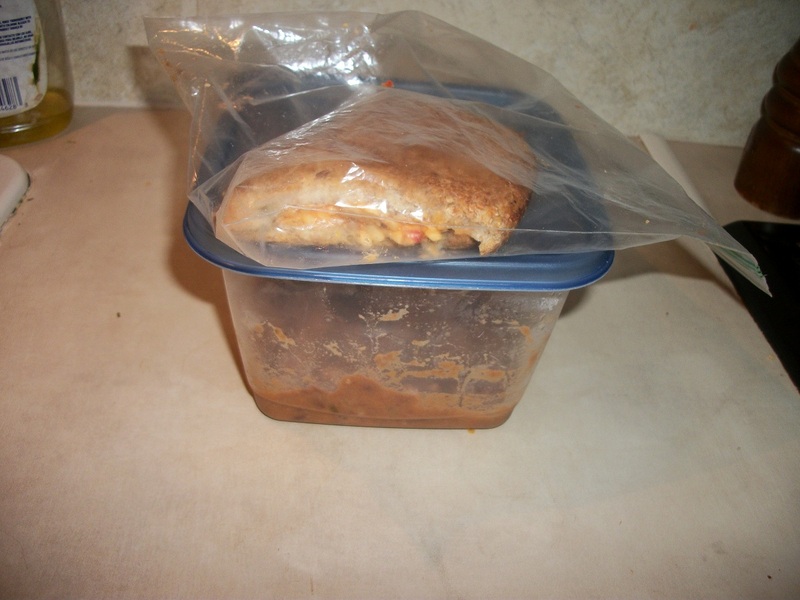 This is shared at The Frugal Girl, Food Waste Friday. Mix the dish soap and water in a pot, then bring it to a boil. Let it cool….and voila, you have bubbles! 🙂 Gracia’s glad to have some more bubble soap, so she can blow bubbles again! Here’s my groceries for the first 2 weeks of July. I went to HEB, Sam’s Club and Albertsons. My total at HEB was $97.67. 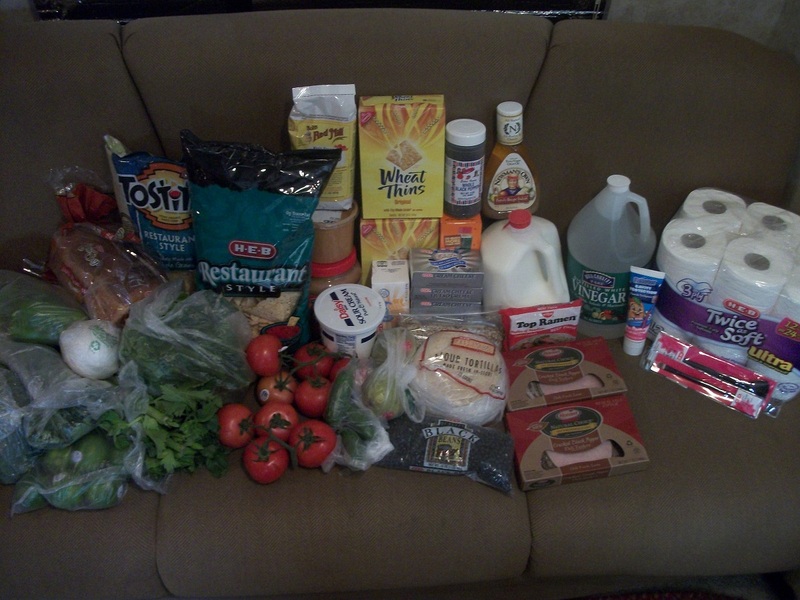 My Albertson’s trip I spent $38.20 and saved $31.38!!!! It was all done by buying on sale items. The 2 roasts were buy one get one free (perfect since Cameron requested a roast as his b-day meal). 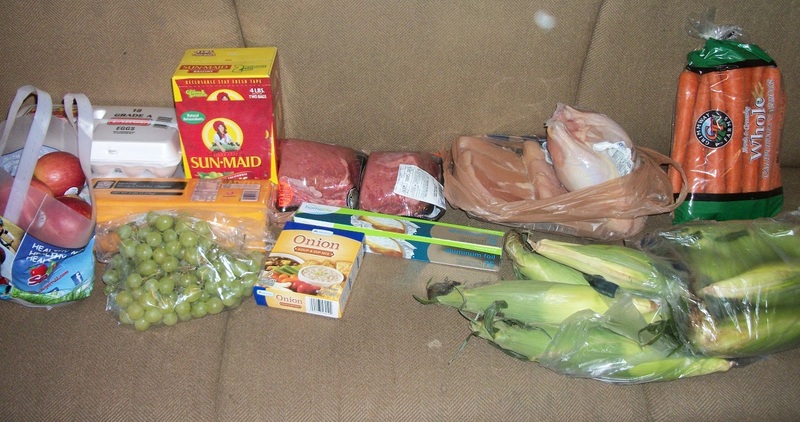 The chicken breasts, whole chicken, grapes, apples and corn were all on sale too. It seems like HEB’s everyday prices are generally cheaper, but Albertsons has some great sales, especially in meat. So I’m trying to mostly shop at HEB and stop in at Albertsons for any great sales. Sam's Club and Albertsons Groceries. Saved $31.38 at Albertsons! And I spent $43.44 at Sam’s club. My total in food groceries is: $143.50, leaving me with $106.50 for the rest of the month, which I think is do able, especially since I have 1 roast and 1 whole chicken in the freezer that I’m not even planning on using yet, so I can use them later in the month. My total in non-food items is: $35.81, leaving me $4.19. I bought toilet paper, toothpaste, aluminum foil, laundry detergent and make-up brushes, I don’t think I’ll have to buy much more in this category this month. Roast with carrots, potatoes, gravy and rolls (my mother-in-law brought the rolls). And whole wheat honey carrot cake for dessert. This was Cameron’s birthday meal. I’m realizing that planning my meals for 2 weeks, I don’t have to come up with 14 different main meals, between leftovers and eating out I don’t usually end up making every meal I plan.